Darlene Barriere: Author. Speaker. Coach. : Why is the Difference Between Fitting In and Belonging Important? Why is the Difference Between Fitting In and Belonging Important? 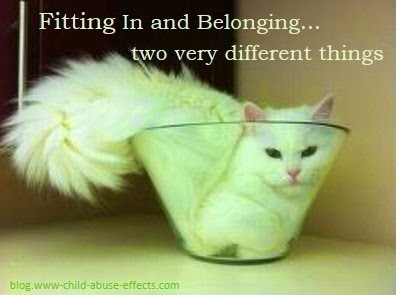 Fitting in and belonging are two very different things. Even though many use the terms interchangeably, they are anything but interchangeable. Fitting in dictates we say and do things that are based on someone elses definition of what is right or okay so that we can get approval and acceptance from them. We know what to say. Who to be seen with. What to wear. What kind of car to drive. What kind of house to live in. Fitting in requires we change in order to fit in. But fitting in is a pitfall. It's a social bid for worthiness. Meaning it's always being chased. It's rooted in the belief that I am not enough. But belonging is being who we are. There is no requirement for change. There is no tie-in to what others think. There is no necessity for approval or acceptance. Belonging is worthiness as a given. No matter what. It's rooted in the belief that I am enough. So, self-love is tied into belonging. The more we love ourselves, the more we feel we belong. The more we love ourselves, the more connectedness there is to that essence that is larger than ourselves: Oneness. When we understand that fitting is is about gaining the acceptance and approval of others, we can go deeper to determine why we feel that need. And within that need, within that which we lack, understanding the why of it can bring more self-love. And thus, more healing. And thus, more belonging.